A good chimney crown is vital to the longevity of the chimney but after years of weather exposure it may start to deteriorate and you will require chimney crown repair. It is vital to schedule chimney crown repair and maintenance as soon as it’s deteriorated or damaged to avoid bigger problems like water damage and leaks that are much more expensive to fix. Chimney Repair NY can fix your damaged chimney crown, just call us at 1-877-952-7425 to schedule service or request a Free Chimney Crown Repair Estimate. Our expert masons can restore the integrity and aesthetic value of your chimney, prevent structural compromise, and prevent water intrusion by repairing your damaged chimney crown. We also install new chimney crowns. The chimney crown plays a vital role in shielding the chimney's structural elements from water and weather deterioration. The chimney crown is typically made of mortar or concrete. Mortar is naturally weaker in the upper sections of the chimney and will slowly deteriorate after years of exposure to rain, snow, and freeze and thaw cycles. 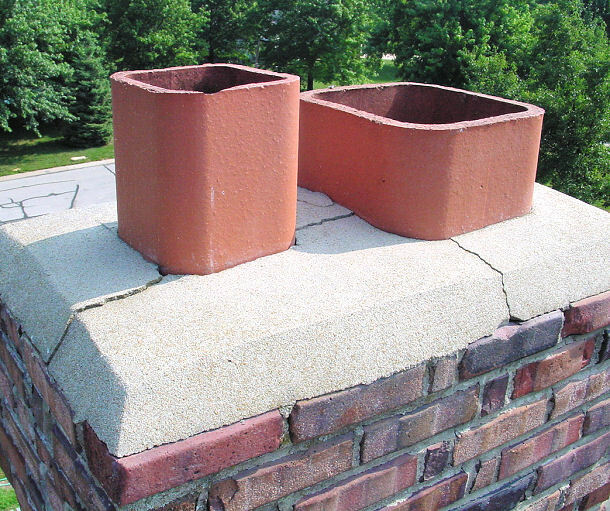 Repairing the chimney crown will prevent serious water leak problems into your chimney and fireplace. Our skilled masons use the best materials to repair or install new chimney crowns so it will last you for many years to come. We construct and repair metal, stone, and concrete slab chimney crowns. Call us today at 1-877-952-7425 for reliable chimney crown installation and repair service or request a Free Chimney Crown Quote. A well maintained chimney crown will help improve your chimney and flue’s durability and functionality. We work hard to ensure all homeowners are satisfied with our chimney crown construction and repair service.